I know the scenario well – you’ve finally found the perfect home, AND you got it under contract! You’re on cloud nine dreaming of furniture placement, paint colors and fantastic summers in your new backyard. You know this is the home that you will live in for years, and THEN you get your inspection report. Bubble. Burst. Ten pages (with photos!) of every little thing that’s wrong with your perfect home…. While this is probably the most critical step of the due diligence period, it’s also the scariest for buyers – in particular first time homebuyers. You are not alone! Remember: Inspections are not only important, but also extremely informative, and with the proper mindset and help from your agent you’ll get through the inspection process and due diligence with as little pain as possible! Your inspection report is owned by you, and is meant to serve as an informational tool for you to understand everything about your future home’s current condition. The report also makes you aware of any major costs or safety issues with the property. There is no perfect home. ALL homes (old and new) have their points of concern. 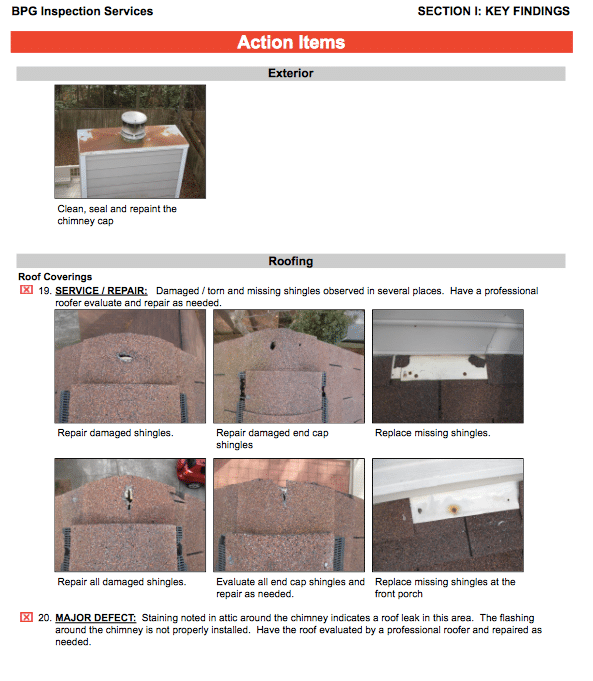 Most items found during the inspection are typical – in fact, we see a lot of the same items come up over and over again (I’m looking at you, rusty chimney cap!) Usually, many of the items in the report are maintenance issues and can be taken care of with $10 and a trip to Home Depot. Most sellers think that their house is perfect, so it’s important to be sensitive to the fact that they probably aren’t aware of many items found during the inspection. Sellers want to sell you a great home, and they are usually willing to fix items that need attention. Many inspection reports have 30+ concerns listed, and the report is NOT meant to serve as a “punch list” of items for the seller to repair. When asking sellers to repair items before closing, it’s best that you ask them to address the most costly/safety related concerns that would keep you from moving into or purchasing the home…AKA – deal breakers. In the past, clients have asked if it’s ok to ask the seller to fix everything on the report. We NEVER advise that clients take that approach as it seems nit-picky and unreasonable. If a seller feels you are being unreasonable then they usually throw their hands in the air and won’t agree to fix much (if anything). However, if you request that the seller address major defect items, safety related items, and reasonable service/repair requests they will typically accommodate you. After all, they do want to sell their home! The due diligence period is a second negotiation period in the home buying process. The seller can agree to repair everything/nothing/some things, but ultimately, it is your choice in the end to walk away if you are unsatisfied with the results of the inspection. A home purchase is one of the biggest investments that you will make, and the inspection is one of the most important steps to protect this investment. We have tried and true Atlanta home inspectors that we highly recommend, and we are here for you every step of the way! Believe me when I say you want an experienced Metro Atlanta agent and inspector on your side, and The Peters Company would LOVE to provide that resource for you!